College graduates looking to pay off their federal student loans have a wide variety of options to choose from when it comes to repayment. Student loans have become almost a given in the college experience, with three-quarters of students taking out at least one student loan during their time in school. The average borrower has $28,288 in student loan debt as they walk across the podium to receive their degree. After graduation, those loans need to be repaid—but understanding how to do so can be confusing. There are many different options for repaying federal student loans and tackling a student loan payment, and it can be difficult to know which one you should choose. Use this handy guide to help you navigate the federal student loan repayment options available to you. There are three types of basic repayment plans available from the U.S. Department of Education designed for people who want a plan that is predictable, easy to prepare for, and consistent. The Standard Repayment Plan of 10 years is the default repayment plan that comes on all federal student loans. Your payments are a percentage of the balance each month and they’re fixed for the life of the loan. With a standard plan, you could end up paying a lot per month, but it’s also the fastest way to get your loans paid off and you will pay less in interest versus longer repayment plans. With a graduated plan, the payments will start out small and increase over time. 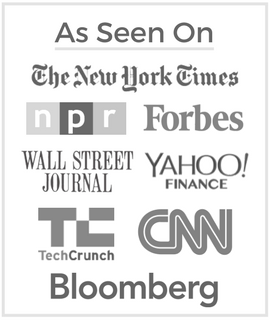 This plan can be good for someone who is just starting out in their career but can expect to be making excellent money further down the road. People in STEM (science, technology, engineering, and mathematics) fields might benefit from this plan because salaries in those fields are typically higher than many other vocations and have strong demand for workers. You can, however, run into future problems if your higher loan payment is more than you can afford. For those who cannot afford a high monthly payment, the extended plan stretches out the loan to a term of up to 25 years. Your payments will be the lowest of all the basic plans, but you’ll pay far more in interest over the long term. Income-driven plans fluctuate with your income. As you earn more, your payment amount will increase; if you experience a period of low wages, your payment will decrease during that time. There are four types of income-driven plans, and while each of them seeks to help people make their payments on time, they have slight differences with terms, relevance of income, and interest rates. The Pay as You Earn Plan, or PAYE, is available on all federal Direct Loans besides Parent PLUS Loans. Non-Direct Loans may be eligible if consolidated through the Direct Consolidation Loan program. Your payment is 10 percent of your discretionary income—what’s left over after food, shelter, clothing, and medical care or other necessities. The term is 20-25 years, and any balance still left over after that time will be forgiven. The Revised Pay as You Earn Plan, or REPAYE, has the same eligibility requirements as the PAYE Plan. Your payments will also be limited to 10 percent of your discretionary income. The term is 20 years for undergraduate loans and 25 years for graduate and professional study loans, and any remaining balance will be forgiven after that time. Income-Based Repayment Plan, or IBR, is available with not only Direct Loans, but also federal Stafford loans and consolidation loans as well. The term is 20 years, and you’ll also see your outstanding balance forgiven after that time. Payments are 10-15 percent of your discretionary income. The Income-Contingent Plan, or ICR, is available to all Direct Loans including Direct Consolidation Loans, and your payment is either 20 percent of your discretionary income or the amount you’d pay on a fixed repayment plan over 12 years, adjusted for your actual income. The term goes all the way out to 25 years, and you still have the forgiveness after that time for any remaining balance. This final income-driven repayment plan bases your payment amount on your annual income, and the term is only 15 years. It’s available to all federal Stafford loans, as well as FFEL PLUS and consolidation loans. The payment amount does change each year based on your increase or decrease in salary, and you don’t get your balance forgiven after the term is over. With this plan, you’ll also pay much more in interest than with the standard 10-year plan. When you take out a direct consolidation loan for your federal student debt, you’ll find that the income-driven plans are still available to you. During the consolidation process, you’ll be offered a variety of repayment plans to choose from based on the type of loans you’re consolidating. 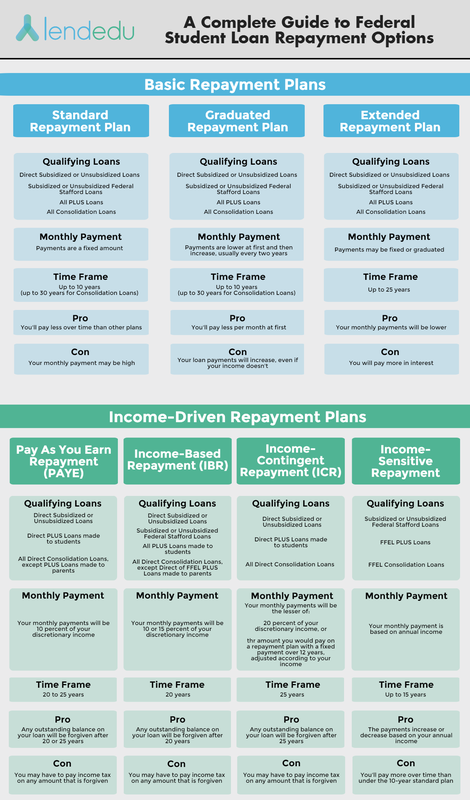 As you read above, not all income-driven repayment plans are available for every type of federal loan, so you’ll need to understand what type of loan you have before consolidating. Once your consolidation loan is complete, all of your existing loans will be paid off, with just the consolidation loan still outstanding for repayment. You’ll have one monthly payment based on the plan you chose during the consolidation process. With all of these options, it might be a bit confusing to figure out which one you should pick. Before making any decisions, think about your current—and proposed future—financial situation and talk to your loan servicer. It’s not just about what you can afford now, but what you may be able to afford five or even 10 years down the road. What are your long-term goals for your personal finances, your family, and your employment situation? Personal preference will play a role as well. Would you rather have a very small monthly payment that you make for a long time, or are you willing to tighten your belt and put more toward your loans in an effort to get them paid off quickly and to save? All of these factors and more will be part of your decision-making process. Regardless of what kind of federal student loan you have, there are options for you in repayment. Look at all of those options before making a commitment and ensure that the choice you make is the best one for you and your family—not just now, but several years down the road as well. There are other considerations aside from payment plans including student loan forgiveness for public service, and these may be worth exploring as well. You can read more about student loan forgiveness with our guide.